杨玉玲, 王照岩, 杨志一, 李洪利, 尹崇高, 刘雨清. miR-125a-5p通过PI3K/Akt/MMP信号通路抑制乳腺癌细胞的侵袭与转移[J]. 中国药理学通报, 2018, 34(8): 1145-1149. YANG Yu-ling, WANG Zhao-yan, YANG Zhi-yi, LI Hong-li, YIN Chong-gao, LIU Yu-qing. miR-125a-5p inhibits invasion and metastasis of breast cancer through PI3K/Akt/MMP signal pathway[J]. Chinese Pharmacological Bulletin, 2018, 34(8): 1145-1149. Abstract: Aim To investigate the potential mechanism of miR-125a-5p inhibiting invasion and metastasis of breast cancer cells. Methods qRT-PCR was used to detect the expression of miR-125a-5p in tissues and cells. The transient transfection technique was used to transfect the overexpressed plasmid into MDA231. Transwell invasion assay was used to detect the effect of miR-125a-5p on invasion ability of breast cancer cells in each group. Western blot was used to detect the phosphorylation level of Akt, the expression of matrix metalloproteinase 2 (MMP-2) and matrix metalloproteinase 9 (MMP-9) in each group of breast cancer cells. Results of clinical specimens detection showed that the expression of miR-125a-5p in breast cancer tissues was significantly lower than that in adjacent normal tissues, which was related with lymph node metastasis. In vitro cell culture experiment showed that the invasion ability of the cells transfected with miR-125a-5p was significantly reduced, the phosphorylation of Akt significantly decreased, and the expression of MMP-2 and MMP-9 was down-regulated. At the same time, the invasion of the cells transfected with GRB associated-binding protein 2 (GAB2) and miR-125a-5p was significantly enhanced, Akt phosphorylation was boosted obviously, and the expression of MMP-2 and MMP-9 increased significantly. It revealed that GAB2 and miR-125a-5p jointly passed through the PI3K/Akt pathway, thus affecting the changes of MMP-2 and MMP-9. Conclusion miR-125a-5p inhibits the invasion and metastasis of breast cancer through PI3K/Akt/MMP signal pathway. PR: Progesterone receptor; ER: Estrogen receptor. Fig 2 miR-125a-5p inhibited invasion of breast cancer cells(x±s, n=3) Transfected MDA231 cells were treated with the stimulation of 10 μg·L-1 EGF. A: Representative images of penetrated cells with EGF stimulation; B, C: Quantification analysis of Transwell invasion assay on cells. *P < 0.05 vs MDA231/NC or MDA231/Con+miR-125a-5p. 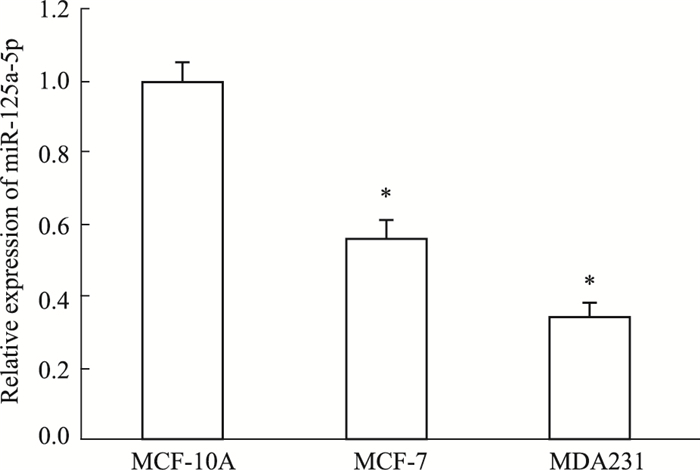 Fig 3 Expression of miR-125a-5p affected phosphorylation level of Akt through EGF stimulation (x±s, n=3) Transfected MDA231 cells were treated with the stimulation of 10 μg·L-1 EGF. Expressions of Akt and p-Akt were detected by Western blot. *P < 0.05 vs MDA231/NC(+) or MDA231/Con+miR-125a-5p(+). Fig 4 miR-125a-5p down-regulated expression of MMP-2 and MMP-9 protein(x±s, n=3) Transfected MDA231 cells were treated with the stimulation of 10 μg·L-1 EGF. Expressions of MMP-2 and MMP-9 were detected by Western blot. *P < 0.05 vs MDA231/NC(+) or MDA231/Con+miR-125a-5p(+). Zhou J, Zhao T, Ma L, et al. Cucurbitacin B and SCH772984 exhibit synergistic anti-pancreatic cancer activities by suppressing EGFR, PI3K/Akt/mTOR, STAT3 and ERK signaling[J]. Oncotarget, 2017, 8(61): 103167-81. 徐新伟, 李佩瑞, 张增山, 等. miR-125a-5p通过靶向调控GAB2抑制乳腺癌细胞的迁移能力[J]. 中国生物化学与分子生物学报, 2017, 33(9): 925-30. Xu X W, Li P R, Zhang Z S, et al. miR-125a-5p inhibits the migration of breast cancer cells by targeting GAB2[J]. Chin J Biochem Mol Biol, 2017, 33(9): 925-30. 田红艳, 陈萍萍, 李笑, 等. Gab2通过PI3K/Akt/ARK5/MMP途径影响乳腺癌的侵袭和转移[J]. 中国药理学通报, 2015, 31(7): 1014-8. Tian H Y, Chen P P, Li X, et al. Gab2 effects the invasion and metastasis of breast carcinoma through PI3K/Akt/ARK5/MMP signal pathway[J]. Chin Pharmacol Bull, 2015, 31(7): 1014-8. Mukherjee D, Zhao J. The role of chemokine receptor CXCR4 in breast cancer metastasis[J]. Am J Cancer Res, 2013, 3(1): 46-57. Chinese Pharmacological Bulletin, 2018, 34(8): 1145-1149.